The AirLink network delivers an extraordinary level of broadband connectivity. Fixed Wireless Internet Access is a next-generation technology that is easy to install, fast, and reliable. Our wireless network is powered by a proprietary point to multipoint technology and leverages the available 5G spectrum for unparalleled performance and reliability. Installation is quick and easy. 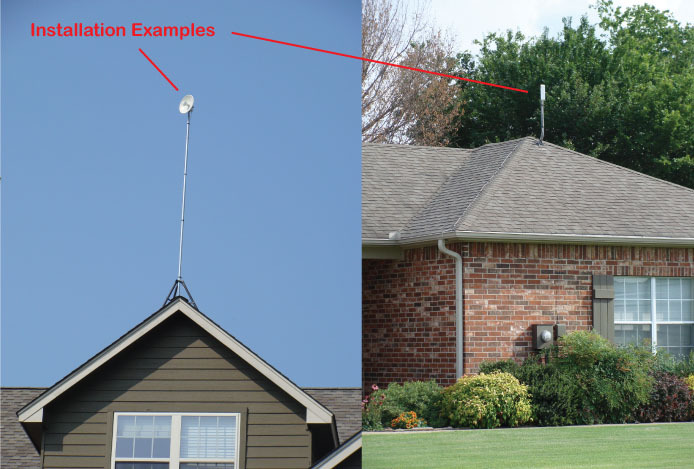 We’ll set up an antenna that communicates with the nearest AirLink tower and run a standard Cat5 cable from the antenna into your home or business. Internet service is just the beginning. With AirLink, you can cancel your satellite or cable service and stream your favorite programs with your smart TV, Amazon Firestick, Roku or Apple TV device. AirLink’s basic 3Mb internet service is great for shopping, email, social media and general web browsing. This package offers speeds of up to 3Mbps download and can be used for standard definition (older 480i resolutions) streaming video such as Netflix, Hulu and YouTube. This is our most economical internet package. Netflix recommends 3Mb for standard definition (480i) and 5Mb for high definition (1080p) streaming so that you can enjoy the show without buffering. AirLink also recommends a minimum of 5Mbps for streaming. A streaming HD video will use up all of the 5Mb package during the stream so if you want to use other devices at the same time while streaming, you might consider a higher package. Ask yourself: How many devices will be using the internet at the same time? Many of today’s gaming consoles can be played over the internet. The Playstation, Nintendo and Xbox can be used on any of AirLink’s internet packages. Most games do not require high capacity, such as 10Mb or 15Mb. They require low latency. All of our internet packages have low latency and are suitable for online gaming. If your household will have mutilple people using the interent at the same time, you might consider a higher package for additional capacity. The network cable we install in your home can be directly connected to a desktop, laptop, Smart TV, DVD player, Xbox, PlayStation and many other devices. However, if you would like to share the internet connection with multiple devices, you will need a wireless router. We offer basic Netgear or Linksys wireless routers that can be installed and configured at the time of installation for a one-time purchase price of $50.00. Need Help? Call us at 918-853-5994.